When General Mills put out the call for bloggers to create some cereal-based treats for Halloween I noticed Cheerios were on the list. CHEERIOS! The foundation of Kiddo’s nutrition. I’m in! These were so much fun to put together, and Kiddo is thrilled with them. The inside is based on an old favorite recipe, and the peanut butter candy coating is from a classic Betty Crocker recipe. It’s play time! Take small amounts of the peanut butter mixture and pat it onto the Cheerio pumpkins till the Cheerios are fully coated, then use the edge of a rubber scraper to make lines in each pumpkin. Finally press one green jelly bean in the top of the pumpkin for a stem. All done! I totally LOVE these!!! Oh my gosh, they are so cute! And I love the cake plate too (and orange ribbon)!! Oh my gosh, those are so adorable! And look so yummy!! seriously creative and perfect for Autumn. i’d definitely opt for my favorite Multi Grain Cheerios on these! These look fantastic! We’ll have to try them. Wow, I would have never guessed cheerios is one of the ingredients from the picture! Looks good to eat NOW! I admit I’m mourning the ending of summer. But when I see cute tributes to fall like those pumpkin-shaped treats, I am ready to welcome the new season with open arms. This look fab-u-lous! 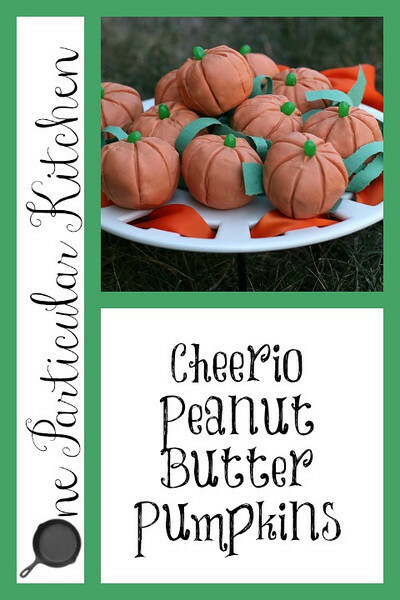 We have been thinking of hosting a pumpkin party, and now I’m ready to start inviting people so I can make these! These little pumpkins are so cute! About how many pumpkins does the above recipe make? I’m thinking of making them for our office Halloween party, but I think I might cut the recipe in half. K, I think I got about 14 out of this? You’re so nice to do that! ok, OPK. Where do I find paste food coloring. Everywhere I’ve checked (Target and Acme) don’t have it. I’ve got some baking to do! Michael’s or Joann? I used gel which I got at Publix. 🙂 You just don’t want liquid. i tried it with my kids and they loved it!